What is beautiful? Repulsive? Are you attracted to it? Are you beautiful, or unloved? These question resonate as one reads "The Beauty." Aliya Whiteley's THE BEAUTY offers a compact dose of weird fiction, body horror specifically, in which humanity is evolving into mushrooms. Expect a mashup of William Golding's 1954 Lord of the Flies and P. D. James's 1992 novel The Children of Men: a cluster of men survive in a dystopian future where all the women are dead (no hope for reproduction). The Beauty is saturated with philosophy on "what is beautiful?" and "what is humanity?". Bob Milne's Beauty in Ruins Book Reviews led me to this wonderful story. This edition has two parts, the first half is the titular story, and the other half is a bonus shorty story called "Peace, Pipe." Some may think 100 pages is too short, but for a weird fiction shorter is often better. Each sentence of "The Beauty" is packed with meaning. Don't expect any fluffy filler. This style is not suited for mega-tome page epic-fiction! Instead, it begs to be read aloud, like a poem... as the protagonist would tell a story. The best way to communicate the style is with Excerpts (see below). No worries, I left out any mushroom/human romance. Don't let the intellectual narrative fool you, there is plenty of action. 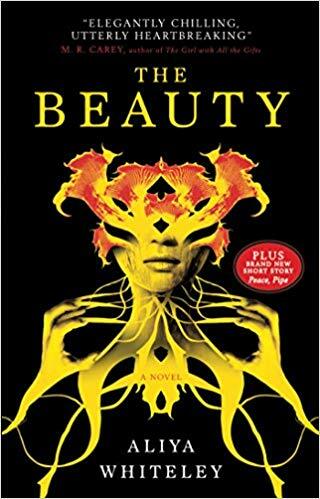 Each section ramps up the tension dramatically as Nate and the other men are confronted with fungal manifestations of women, and they struggle with repulsion and attraction. With the future of humanity on the line, and the desire to reproduce, there is much at stake. Jealously and murder ensue. Incidentally, my son and I are playing Dark Souls 1 (remastered) and Dark Souls 3, and the vision of the Parent/Child Mushrooms from Darktoot Garden and Ash Lake were evoked. Imagine if you were encouraged to start a family with those! In summary, The Beauty offered everything I expected and desired: a mysterious adventure, evocative prose, and unique storytelling. It is deep, but thrilling. PEACE, PIPE, is a bonus story that is 50% of this book. An alien diplomat chronicles its exploits (having accidentally started a war on Demeter) while quarantined and communicating to a pipe (which speaks as water flows through it, and evokes the sounds of a flushing toilet). Again, the themes of storytelling and communication are foundations, as well as an invitation to the reader to change perspectives on different cultures. No body horror in this one. "There are signs, I don't care what William says. There are signs of change, of regeneration, and I saw the first mushrooms in the graveyard on the morning after I ripped up the photograph of my mother's face and threw the pieces over the cliff, into the fat swallowing folds of the sea..."
My name is Nathan, just twenty-three and given to the curation of stories.I listen, retain, then polish and release them over the fire at night, when the others hush and lean forward in their desire to hear of the past. They crave romance, particularly when autumn sets in and cold nights await them, and so I speak of Alice, and Bethany, and Sarah, and Val, and other dead women who all once had lustrous hair and never a bad word on their plump limps...Language is changing, like the earth, like the sea. We live in a lonely, fateful flux, outnumbered and outgrown." "When [William] told me of his journey, that was how he finished it--he fitted there. I find this to the strangest of expressions--how does one fit in with other people, all edges erased, making a seamless life from the sharp corners of discontent? I don't find anything that fits in such a way. Certainly not in nature. Nothing real is meant to tessellate like a triangle, top-bottom bottom-top. The sheep will never munch the grass in straight lines." "[Doctor Ben] told me diseases were like people. They fight and fight and throw themselves around to escape the walls of tighter and tighter boxes." But the Beauty knew form the many experiences of the women that had gone before, that men did not always love what was good for them. Men could attack, hurt, main and murder the things that came too fast, too suddenly, like love...."